RPM / Income is up 157% on my $10000 Investment Website in 2 weeks! 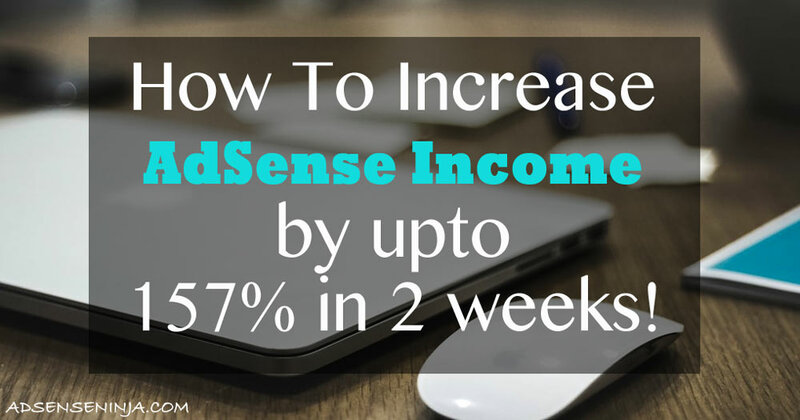 Hey webmasters – I want to make this quick update, to encourage you to optimize and test AdSense ads and placements on your sites. 2 weeks ago I purchased my first 5-figure investment website for a cool $10000, and in in last 14 full days, my AdSense earnings are up 157%, with just 10 hours of optimizing placement and site layout! Let’s look at details. I bought the site on Dec. 2ish, and the transfer was completed in the evening of Dec. 6, 2016. So my first full day of earnings was Dec 7. For last 14 days (Dec 7 – Dec 20) the site has made around $390 (its 1:22PM EST, 12/20/16, at the time of writing this, so today’s earnings are not finalized). So that gives as an average of $27.86 per day. I was running an AB Test for a Top Placement Ad on desktop, and was able to find which ad performs 138% better. I was testing 728*90 Leaderboard VS 336*280 Large Rectangle ad sizes. In the “last 30 days” before sale – Nov 2 – Dec 1, 2016, the site has earned $325.44 or $10.85 / day. At this rate, the estimated monthly income from the site will be around $836 (compare to $325 before I took over the site). This is about 2.6x improvement in income, for 10 hours of optimization work! I will stress the point here: In first 2 weeks, site has made more that it did in the last 30 days!!! Note $373.44 total – it’s 1:45PM at the time of taking this screenshot, so there is 10 more hours of reporting not counted in. So, not bad at all. But most important for me – this means my methods work, and sometimes better than expected! Yes, i’m skeptical too, but just in case you were wandering – the traffic did not go up (enough), to justify increase in earnings and RPM! 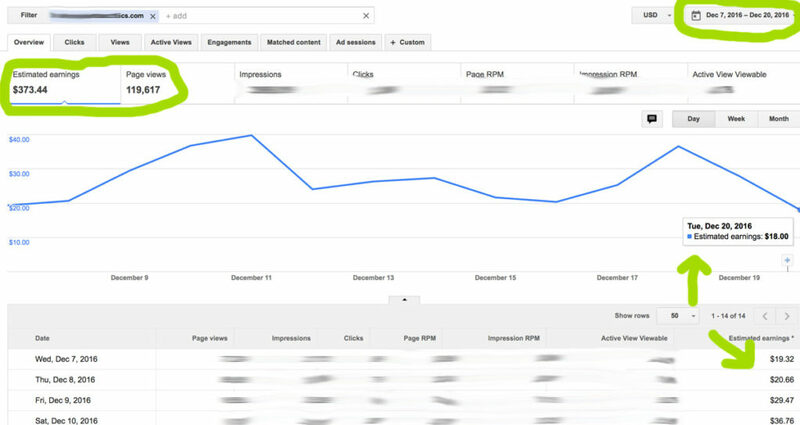 RPM before purchase: If we look at screenshots, RPM for Nov was $1.407 ($325.44 / 231K page views). RPM after purchase: In last two weeks RPM was $3.12 ($373.44 / 119.6K page views). 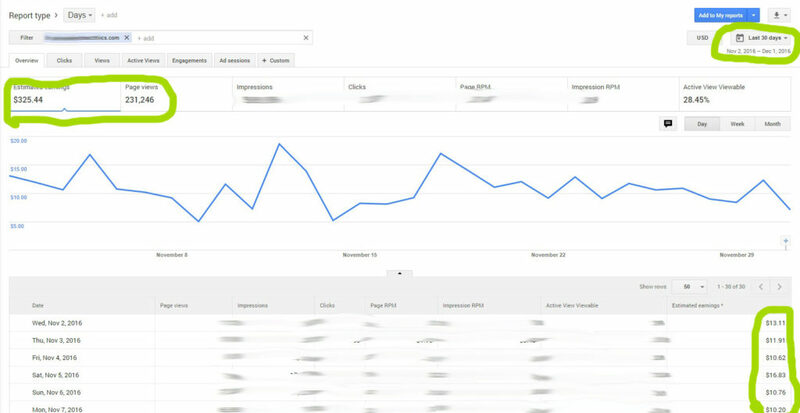 Therefore, I increased the revenue pre site visitor by 222%. This is the interesting part, and I won’t tell you all the secrets, but I will give you most important ones. I got rid of AdSense placement WP plugin (not exact name), and placed all ads manually! I placed ads between page/post title and content – this gave me the biggest boost. Before I got the site, 1st ad was after 1st paragraph. Created 2 versions for each ad placement. One for desktop, and one for mobile. Example. If you come to site on a computer, you will see a 728×90 or 336×280 ad unit. On mobile, you will see a 250×250 or 300×60 in the same spot – be it below title, or after content. I’m running an A/B test to see which one of those ad sizes makes more, with equal number of impressions. I changed mobile site logo from 150x150px square to 50px tall logo. This makes ad viewable without scrolling, and shows content on mobile. I decreased content margins, in CSS stylesheet, to show more content on same screen size. There are many more subtle changes, that may or may not have massive effect on earnings. I am still running multiple AB tests on various placements, so the earnings are actually higher that what they are on paper. This means that I have version A and B of ad in same spot, and one performs better than other. So if I switch on better performing versions right now, my RPM will go up even further. Again i will say this – i’m not making this post to show you “look how much money I make”. The point is – never stop optimizing and testing your Google Ads – you will be amazed at the results you can achieve! If you know a little code (can copy/paste without breaking the website), check out my free PHP mobile ad switcher script, which I use for displaying Desktop / Mobile ads in same location. 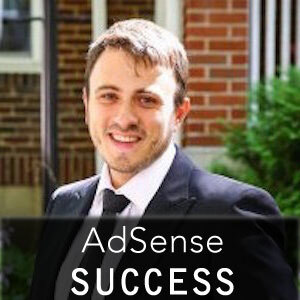 Don’t use AdSense plugins for WP or any other CMS – place all ads manually – your results can easily double just by doing this! Learn basic HTML/CSS so you can make small modifications to your site layout (to achieve big results). 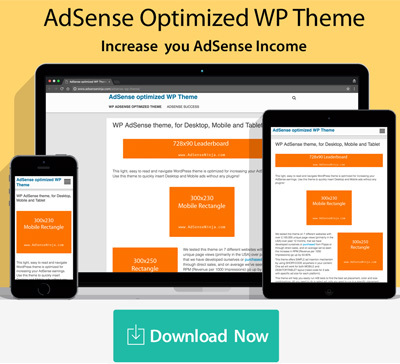 Lastly – try my AdSense WP theme, which has all my tune-ups, mobile ad switcher, manual ad placement and AB testing features built into it, along with fast load times and clean layout!